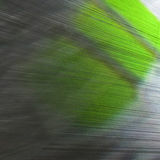 Studio shot of Buoy [Fr-Agile] - See also: Video documentation by Jo Millett. 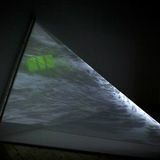 Developed during an artist’s residency at Spurn Point on the Humber Estuary, "Buoy" is one of two three-dimensional video sculptures produced in close co-operation with Jo Millett (video). The timebased sculptures subtly recall centuries of slowly shifting sands and reflect the fragility of a historic coastline. 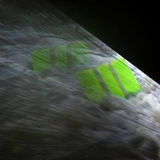 'Buoy [Fr-Agile]' features close-up footage of a performance, Fr-Agile, which took place on a wet and blustery morning in August 2008 on the shoreline of Spurn's North Sea beach. Four yellow buoys marked the location where the estuary side of Spurn once existed in the 1850's. They were exposed to the incoming tide, wind and weather, the powerful forces that shape Spurn over time. The process, lasting from low to high tide, was documented on video by Jo Millett. 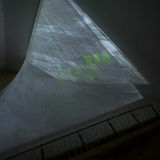 Footage of one of four buoys tossed about forcefully by the incoming sea is projected onto a curved semi-transparent screen made of unwoven warp threads, stretching between wall and floor. 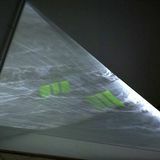 The shape of the screen goes with the flow of the water. 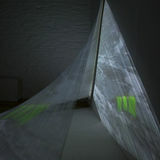 The three-dimensional image shows waves which run along the threads through the space and undulate against the walls behind the screen.